The story and history of Saint Elphege. Elphege was born in the year 954, of a noble Saxon family. He first became a monk in the monastery of Deerhurst, near Tewkesbury, England, and afterwards lived as a hermit near Bath, where he founded a community under the rule of St. Benedict, and became its first abbot. At thirty years of age he was chosen Bishop of Winchester, and twenty-two years later he became Archbishop of Canterbury. In 1011, when the Danes landed in Kent and took the city of Canterbury, putting all to fire and sword, St. Elphege was captured and carried off in the expectation of a large ransom. He was unwilling that his ruined church and people should be put to such expense, and was kept in a loathsome prison at Greenwich for seven months. While so confined some friends came and urged him to lay a tax upon his tenants to raise the sum demanded for his ransom. "What reward can I hope for," said he, "if I spend upon myself what belongs to the poor? Better give up to the poor what is ours, than take from them the little which is their own." As he still refused to give ransom, the enraged Danes fell upon him in a fury, beat him with the blunt sides of their weapons, and bruised him with stones until one, whom the Saint had baptized shortly before, put an end to his sufferings by the blow of an axe. 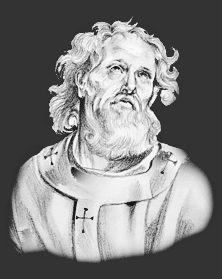 He died on Easter Saturday, April 19, 1012, his last words being a prayer for his murderers. His body was first buried in St. Paul's, London, but was afterwards translated to Canterbury by King Canute. A church dedicated to St. Elphege still stands upon the place of his martyrdom at Greenwich. The Feast Day of Saint Elphege is April 19. The origin of Feast Days: most saints have specially designated feast days and are associated with a specific day of the year and these are referred to as the saint's feast day. The feast days first arose from the very early Christian custom of the annual commemoration of martyrs on the dates of their deaths at the same time celebrating their birth into heaven.